As global temperatures continue to rise along with CO2 emissions, leaders in need of solutions should be cautious when considering the potential of bioenergy with carbon capture and storage (BECCS). While the wholesale success of these technologies was assumed in many of the climate models used in developing the Paris Climate Agreement in 2015. In the 2015 United Nations Climate Change Conference, the world agreed on implementing greenhouse gas mitigation plans which focus on producing negative carbon dioxide emissions to help curb climate change. 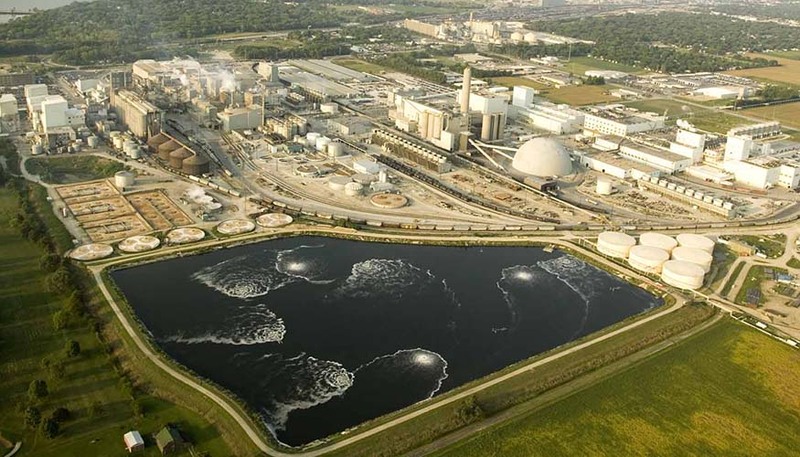 Illinois Industrial Carbon Capture and Storage Project. Capture CO2 from ADM’s Decatur corn processing facility and store it underground. Bioenergy with carbon capture and storage (BECCS) facilities generate electricity by burning trees and crops that have taken CO2 from the atmosphere throughout their lifetime. When the biomass is burned, BECCS facilities capture the CO2 emissions and store them or, more often, use CO2 in order to enhance oil recovery (EOR). BECCS is one of the technologies the potential to achieve negative emissions if easy-to-grow feedstocks, such as switchgrass, are grown with sustainable practices and the captured CO2 is sequestered. However, these conditions don’t currently exist at commercial facilities. In April 2017, the U.S Department of Energy (DOE) announced that the Illinois Industrial Carbon Capture and Storage (ICCS) project at Archer Daniels Midland Company’s (ADM) Decatur corn ethanol facility had begun operations by injecting carbon dioxide into a large saline reservoir. The ICCS project stores more than 1 million tons of CO2 a year. The project captures CO2 from ADM’s Decatur corn processing facility, and stores it almost a mile and a half underground. The total project cost is $207.9 million and it has received a cost-share agreement of $141 million investment from the Department Of Energy. The project team members include ADM, Schlumberger Carbon Services, Illinois State Geological Survey (ISGS), University of Illinois, and Richland Community College (RCC). The technology demonstrated for this project aimed to help the development of the regional CCS industry (i.e., enhanced oil recovery in the depleted oilfields in the Illinois Basin). Although the main purpose of BECCS technology is to reduce greenhouse gases and help combat with climate change, practically, CO2 has been captured in order to enhance oil recovery, which will result in more CO2 in the atmosphere. As the world’s focus is on keeping global temperature below 2 degree Celsius, using carbon capture storage (CCS) and BECCS in this way will perpetuate the use of fossil fuels. Also, emissions from the transportation of feedstock and the use of nitrogen fertilizer for growing crops could be a big challenge and accelerate the trend of global warming especially associated with ozone destruction. 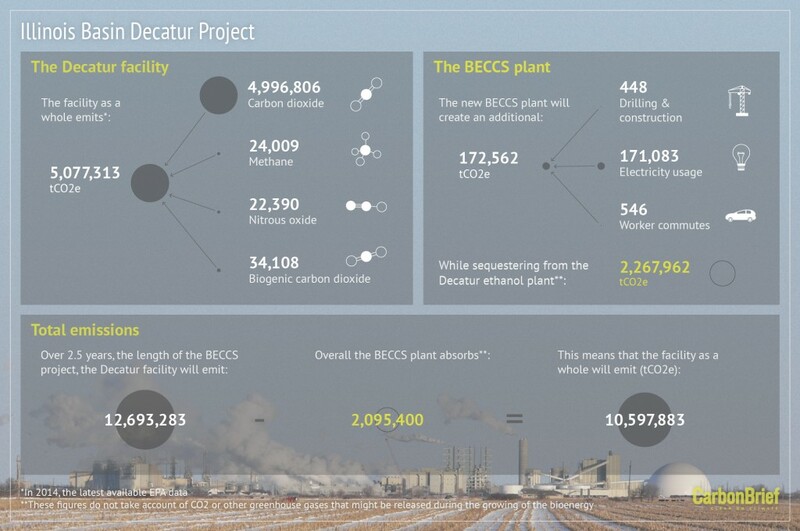 The Illinois Basin Decatur facility and the EBCCS plant as a whole emit more CO2 than the BECCS plant has been designed to capture. The graphics info provided by Carbon Brief shows that the total CO2 emissions have been emitted by Decatur facility over 2.5 years of the operation was 12,693,283 tons of CO2. However, the EBCCS plant only absorbed 2,095,400 tons of CO2 which means that Decatur facility as a whole has emitted 10,597,883 tons of CO2 even with BECCS capacity. Thus, this project failed to fulfill the purpose of reducing carbon and curbing climate change. The Illinois Basin Decatur Project. By Rosamund Pearce for Carbon Brief. Caption: The Illinois Basin Decatur Project. By Rosamund Pearce for Carbon Brief. High Cost of Capturing and Storing Carbon: It costs $100 to capture a ton of CO2 for a biomass plant. Whereas, fossil fuel plants are capturing carbon for about $60 a ton. This difference is based on varying bioenergy feedstock prices; energy production process; and capture technology. Also, transporting large amounts of biomass long distances to the storage site would significantly add to the cost of BECCS, since biomass tends to have a lot of weight relative to its energy. Transporting CO2 to the reservoirs via pipelines or trucks: The transportation networks are costly and also turn more CO2 back into the atmosphere. More infrastructure – such as pipelines – would need to be built, which increases the cost of BECCS and indirectly results in more emissions through the construction process. Also, CO2 leakage from pipelines or storage sites could endanger people, harm marine ecosystems, and threaten freshwater ecosystem. Navigating the property rights of local communities can also be a challenge. Effects of increased fertilizer use, such as nitrogen: Nitrogen fertilizers can be leached into the groundwater and washed into waterways, resulting in serious health, environmental, and economic damage. Nitrogen fertilizers applied in agriculture can add more nitrous oxide to the atmosphere than any other human activity. Nitrous oxide also moves into the stratosphere and destroys ozone which could result in increasing global heat. Nitrogen pollution is identified as a cause of decline in native species and is a threat to biodiversity for vertebrate, invertebrate and plant species. A study found 78 federally listed species identified as affected by nitrogen pollution. Use of fertilizer nitrogen for crop production also influences soil health, by reducing organic matter content and microbial life, and increasing acidity of the soil. Water concerns: Agriculture and power generation are highly water intensive. In order to produce 1 ton of ethanol, 3.5 t of CO2 and 5 t of H2O is needed, which means that more than 21,000 t of CO2 and 300,000 t of water vapor are consumed each year. However, more than 3 billion people are already affected by water scarcity so it is a critical challenge in utilizing BECCS technology. Food Scarcity: food prices would increase as a result of changes in land use. Also, since climate change has already threatened the crop yields harvest, sudden changes in the weather could result in food shortage or even famine in some regions. Altering lands to a specific crop yield would affect the land quality and may result in regional resource shortages. Geological storage sites for CO2: In the fertile Midwest of the U.S., croplands are too far from geologic storage to be a viable location for BECCS in the near-term. There are relatively few pipelines in place for transporting CO2 and the long-distance transportation of large volumes of captured CO2 is expensive, particularly if many small pipelines have to be built. Biomass could be transported to sites where CO2 storage is available, but that would significantly add to the cost of a BECCS project. Land Use challenges: Could displace or expose small farmers to the volatility of world markets. Also, as a result of changing land applications, soil erosion, and degradation could happen and soil would lose its fertility. Poor management of bioenergy crop production can result in soil carbon loss from direct and indirect land use changes and significantly affect the net amount of CO2 removed by BECCS. In addition, land rights of farmers & ranchers should be considered as important challenges as well. Cost of Ethanol Production: Depending on a cost of a barrel of oil and production cost of gasoline refining, ethanol can either increase or slightly decrease the cost of a gallon of gasoline. Overall, even though the U.S has a large potential for geological storage sites, there is still a need for transportation systems for either biomass or CO2 for the large-scale deployment of BECCS. Also, concerns associated with the land, water, and fertilizer use that would be required at the large-scale deployment of BECCS make the long-term economic viability of this technology uncertain. Tax incentives such as 45Q might cover some parts of the related costs, however, the health, environmental, and economic impacts of this project on the society is still unclear as well. Overly optimistic assumptions about quickly achieving negative emissions on a large scale are dangerous. The world carbon budget is running out for 2 degree Celsius and we have already used the 1.5 degree’s carbon budget. While investments in BECCS are needed, these technologies do not give us a license to postpone eliminating emissions from other sources. And BECCS is only a solution if sustainable agriculture practices are employed, CO2 emissions are permanently sequestered and not used for oil recovery, and project sites are carefully selected to reduce emissions from transportation.